Pretend like you are drinking at the Stube...even at home! Perfect for drinking at home, this glass will make you wish you were back at the Boar. The Distillery! One of Toledo's best concert venues! Basic pint glass, but still very cool. Perfect for drinking at home, this large beer glass will make your friends jealous. And maybe a little scared. White coffee mug from The Flying Joe Coffee Shop. Have your morning coffee then head over to The Flying Joe and try their ridiculously good oatmeal cream pie cookie. 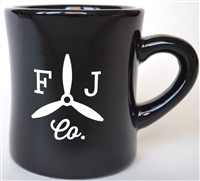 Black coffee mug from The Flying Joe Coffee Shop. Have your morning coffee then head over to The Flying Joe and try their ridiculously good oatmeal cream pie cookie. Never spill your coffee again! This is the famous Klean Kanteen thermos custom made for The Flying Joe.